Ava, a beautiful clean and crisp design created with sweetly scented white lilly and a collection of seasonal blooms teamed up with assorted foliages to bring you this lovely bouquet with a very fresh natural feel. Hand tied qnd gift wrapped in tissue paper and cellophane and will be completed with display box and filled with water. 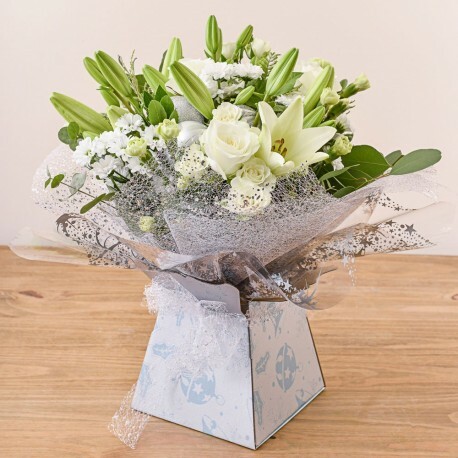 Just ready to add a special and personal message all ready to be hand delivered from your local florist. Delivery available in Hereford and surrounding areas.